A tattoo of a red-breasted sparrow gracefully flies from the inside of Lian Canty’s delicate forearm, symbolizing freedom. Lian explains that the same tattoo was commonly inked on released prisoners of the early 1900s in Great Britain to represent their freedom and remind them of their quest never to return to the confines of a cell. Lian had the body art done at a particular turning point in her life, in a moment of deliverance, the same concept as the branched tree person, an uplifted spirit that she designed and now permanently dances up her ankle. Lian expresses her life through her art. Lian was born and raised in Leadville, Colo. Her father was a civil engineer for Amax but was a taxidermist on the side, specializing in fish. The fish mounts at Dragonfly Anglers are his and he was well known throughout the West for his work. Lian confesses that she doesn’t fish at all, and her mother was busy raising six kids and helping to take care of the taxidermy business’ accounting. 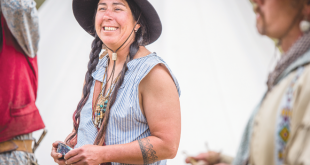 “Leadville was a rough town, it’s pretty red-necky,” Lian remembers, although the family lived out of town so she never saw the violence that sometimes occurs in mining towns. “What happens in a mining community, which is on rotating shifts, is that because the schedules were always changing it caused domestic problems. One week your dad would be home for dinner and the next he’d only be home for breakfast,” she explains. Lian graduated from Lake County High School in 1985. Through her high school years, she had saved up enough money while working banquets as a waitress in Vail to buy a car and also go to Europe, traveling through Germany, London and Paris. Lian had already been accepted to Rocky Mountain College of Art and Design and, heeding a suggestion from her mom, studied graphic arts because those were skills that she could make a living from. She took a full immersion program of two straight years with no summers off. It was all art, all the time and she graduated in 1987. 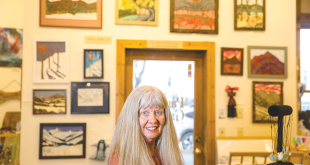 At the time, Crested Butte was affordable and it seemed to Lian that it was an up and coming artist community. Both of her children were born here. “We opened the Rendezvous Gallery and Framing above the Gourmet Noodle. 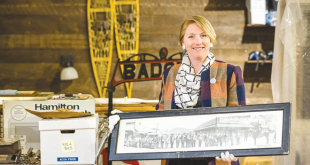 I worked other jobs to support us until the gallery got going,” Lian says of her stint at Rozman’s Motor Lodge and BBQ, where she got to know some of the old timers. “There were quite a few old timers still left and they’d hang out and drink coffee at Rozman’s Restaurant,” she recalls. Lian also worked at Stem’s Floral as a flower arranger, the Teeshirt Shop, and the Grand Butte Hotel, all the while learning how to frame and eventually working more full-time in their gallery-shop. 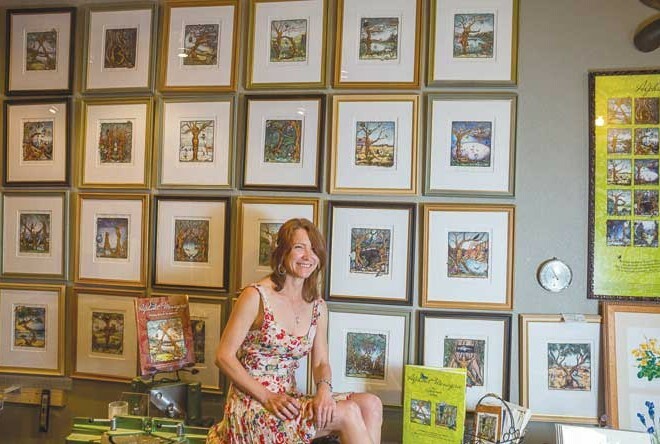 Throughout her various jobs Lian created her fine art, and one of her first series, the Tree People, sold so quickly that she has no records of most of that work. She started painting and drawing botanicals, which were an already acquired fondness of hers, the style reminiscent of the antique botanical illustrations from the golden age of botany, the 1600s through the 1800s. Lian explains that those centuries of illustrations were the beginning of scientific referencing: “The botanists at the time wanted to identify flowers and the only way they could do that was to create drawings of them,” she says. Lian created posters of hand-colored wildflowers to promote the Antique Botanical Show and Sale, which she and her husband put on in conjunction with the Turner Art Gallery in Denver. The Denver gallery had a huge collection of antique prints that were her first inspiration for her botanical creations. When her marriage ended in 2008, she retained the Rendezvous Gallery, moving it seven times, and she currently shares a space with Shock Therapy and electrician Rich Driscoll, an odd coupling, but she laughs, “We’ve known each other forever and we were talking about how we both ended up talking to ourselves when we were working alone and it just worked to jointly share this space,” she says of their year and a half studio partnership. To supplement her Rendezvous Frame and Gallery work, Lian also creates masterpieces of calligraphy—invitations, announcements, poems, usually in ink. “I like to grind my own ink, which I do traditionally with an ink stick and a grinding stone. An ink stick is dried pigment that is pressed together into a block or a stick. The ink stands up on top of the paper and has a more beautiful feel to me when it flows through the brush or pen. When the ink stands up on the paper, instead of soaking in, if you need to correct something, you can scrape off the layer of ink. This summer, Lian is pushing the envelope in her botanical art and fascination by hiking well above the alpine meadows and tree lines to find those short-lived and sometimes rare flowers of high altitude. “I’ve been inspired to do a series on alpine botanicals and alpine wildflowers,” she says of her hikes through rock and vertical with Vinnie Rossignol, who worked with the U.S. Forest Service for many years.